Short films often follow the structure of a poem or joke. Both forms of writing are entertaining in their own right and are easily adaptable for the smaller confines of shorts. Director Damion Power has transformed an original monologue, written by Jessica Bellamy, into an innocent story about a man who discovers the beauty of the W.B Yeats’ poem, When You Are Old. Bat Eyes is a visual metaphor to accompany the structure and elegance of the protagonist’s cherished poem. The film begins with Adam, a 24 year old man, receiving his first eye exam. During the exam, Adam has a series of flashbacks about a girl named Jenny reading When You Are Old in high school. Adam taunts Jenny because she is practically blind. Jenny stands in front of her english class, exposing her love for this poem. Adam’s ignorance uses the opportunity to taunt Jenny’s feelings. After school, Jenny guides Adam back to her home. Adam and Jenny then share a moment of innocent affection for each other. Several years later, 24 year old Adam is able to reflect and appreciate Jenny’s adoration. Eyesight is used throughout the narrative. 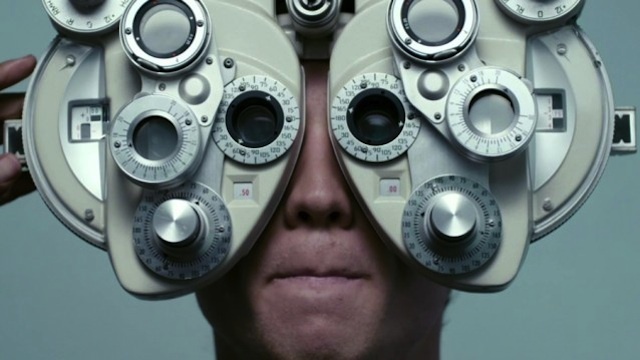 The eye exam provokes Adam to reflect on his past. Thick glasses lead Adam to make comments. Jenny’s lack of vision allows her to appreciate pleasures that are not seen. Yeats poem illustrates a man who looking back on his life. Blindness is the metaphor for the main character’s maturity from youth to adulthood. Bat Eyes could be understood as an illustration of Yeats poem. The literal embodiment for the memory of youth. It could also be read as a poetic moment of reflection on innocent love in adolescence. The poem is just a support. The film can also be appreciated as an interesting backstory for a man going blind. The audience is looking into a moment in his timeline where he begins to accept his condition and see the beauty in it. Success here lies in the film’s ability to create a sense of emotion using universal concepts of time and love. Poetry integrates with character. Characters form a story that melts cynicism in the hardest of hearts. The process in which Bat Eyes was produced is worth noting. Bellamy created a monologue, Little Love, for Fresh Ink’s Voices Project. Fresh Ink is the development program for emerging playwrights from the Australian Theatre for Young People (ATYP). ATYP has an annual monologue writing program, The Voices Project, presenting new work from young writers on stage and online. The monologue was re-written to be produced as this short; a surprisingly lovely, and yes, poetic look at nostalgia, innocence and regret. A moving ode to youth, from the youths of the ATYP.